The Audi A3 is all-new for 2015. The 2015 Audi A3 begins its third generation in the U.S. as a four-door sedan, the first time for this body style in the U.S. Three- and five-door hatchbacks and a convertible are right behind the new sedans. A premium-level vehicle, the Audi A3 boasts a high-quality interior with leather upholstery as standard equipment. As cars in the compact segment keep getting bigger, manufacturers are creating new models to slip into the entry-level category. 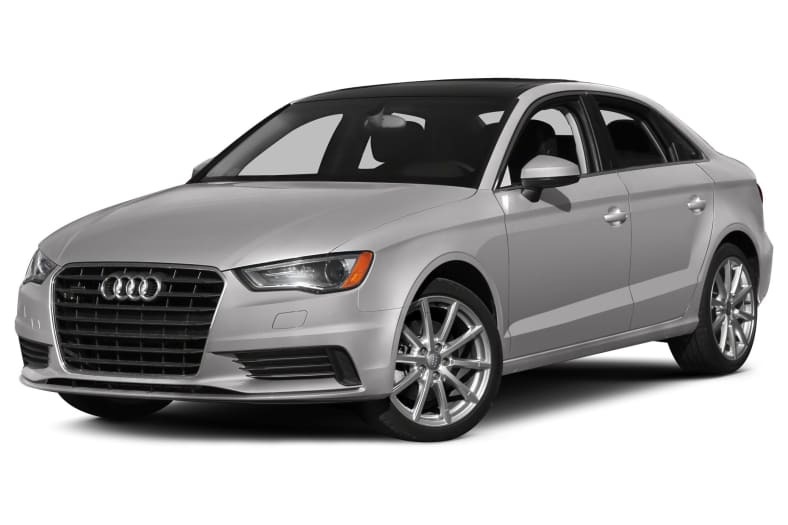 Audi is no exception; while the A4 sedan was once considered Audi's compact offering, the 2015 Audi A3 sedan now takes over as the smallest four-door in the lineup. Riding on a new platform, the 2015 Audi A3 offers a choice of two drivetrains. The standard front-wheel-drive sedan uses a 1.8-liter turbocharged inline-4 that makes 170 horsepower and 200 pound-feet of torque. Fuel economy is EPA-rated at 23/33 mpg City/Highway. Top-of-the-line A3 sedans come with Quattro all-wheel drive and a 2.0-liter turbocharged inline-4 good for 200 hp and 258 lb.-ft. of torque. Fuel economy is an EPA-estimated 24/33 mpg City/Highway. Both models use a 6-speed dual clutch transmission. Like all Audis, the interior of the 2015 A3 is of high quality, with soft-touch materials, a clean, simple layout, and attention to detail. Even the climate control knobs have a well-built, substantial feel in-hand. The standard display screen is thin and retracts elegantly into the dash when not in use. The A3 is packed with many standard features not always found on base models, including leather upholstery, power driver's seat, power sunroof and automatic wipers. A new version of Audi's MMI control interface also is also standard, with 4G LTE data connectivity that effectively turns the A4 into a mobile hotspot, allowing users to pair up to eight compatible devices. Navigation is powered by Google Earth and Google Street View, with real-time weather, traffic and gas prices. Although it's a four-door sedan, the 2015 Audi A3 is best on long trips for front-seat passengers only, though rear space is adequate for average-sized adults on short commutes. Cargo space is average for the class with all seats in place, and split-folding rear seats, including a center pass-through slot, help to make the A3 more versatile. The base 1.8-liter engine is fine in the A3 sedan, and would be an ideal choice for commuting or driving around town. Plenty of power and thrust is on tap driving the top-of-the-line 2.0T Quattro, with the most satisfaction coming in the higher revs. Though we sometimes found ourselves wanting more from the dual-clutch transmission through the winding roads, especially between second and third gears. Ride and handling is comfortable, though we found it a little floaty when pushing it hard around corners on rougher roads.